On January 8th of this year, instead of celebrating my 47th wedding anniversary with my wife in Mt. Vernon, Indiana, I was having a heart attack. The next day I was in Evansville having six bypasses! I'm still relatively young at 71, but not getting any younger. In the last few months my colleagues and I have given serious thought to archiving, preserving the years of work we have all done with our various expertise. One of the most important events in my life occurred in 1977, and I wasn't aware of it until 2010. I wrote the first paper on it on August 12th of that year. I wasn't able to do anything about it then, and the story laid there until I thought about it while recovering my health in 2013. I had always thought it was very important, but still hadn't realized HOW important, so I just added it to my memoirs that I began writing a few years ago. While with or talking to each of my four children (all grown up) I related my story, which was just one of many they had heard and never really appreciated, because I DIDN'T make more of it. It still hadn't hit home. Then, less than a month ago, while doing some research, I read something that made me sit up and take notice. It was like the scene in "Jaws" where Roy Scheider was pouring bloody bait into the sea and the Great White surfaced right before his eyes. In 1997 most of you probably saw the motion picture, CONTACT, based on the concept of Carl Sagan's book by the same name. It's about a heroine's lifelong quest (both spiritual and scientific) to explore the meaning of human existence through contact with extraterrestrial life. It stars Jodie Foster and Matthew McConaughey. The stirring scene and sounds of the SETI contact signal left an impression on me all these years. I always knew that someday something like this would happen and the SETI people would be able to celebrate the years and many dollars spent in this great scientific endeavor. But never in my wildest dreams did I imagine that I would somehow be involved in it. It may be just a coincidence that "Close Encounters of the Third Kind" was filmed in 1977, but it wasn't released until November. It was about an unidentified signal from space, and later contact, and just happened to begin in Indiana. I was invited by the news media to attend the pre-screening of that film. I once headed and operated a UFO detection project called MADAR from 1970 to 1991. MADAR stands for "Multiple Anomaly Detection and Automated Recording". The system used a 254 mm magnet variometer which was monitored by a vertical light beam and relay circuit. When the Earth's magnetic field deviated slightly, the system was triggered and various equipment recorded the data, one which was the time, another the gamma/cosmic ray background nuclear radiation, and yet another the actual graphic movement of the sensor. The project logged over two dozen interesting events, some with mild UFO connections, but nothing eye-opening. But 1977 was a banner year for the project because for six weeks that summer there were seven events that were extremely interesting. However the only reported activity in the skies was regional, none local, and nothing anywhere near conclusive. MADAR Event #15 turned out to be the final one for the year 1977 and was logged on August 15th at l0:14 PM. It was an 18-pulse, 3-minute and 29-second disturbance. MADAR had logged the best and longest disturbance so far. And the background radiation reading was 30 cpm, a 100% increase! For the record, this was a significant reading. All that we lacked was what we were looking for, a good local UFO report. MADAR had recorded seven events in a little over a month. "Something" was going on. This included UFOs reported to law enforcement officers within 60-85 miles, an E-M effect on a smoke alarm in the control room, and a significant background radiation reading. But this meager evidence didn't turn any heads. Both events occurred on August 15, 1977. The WOW signal was received at 11:16 pm EDST. The MADAR event occurred at 10:15 (pm or am are not specified on your site). As best as I can figure, Mt. Vernon is on CDT. Whether or not it was in 1977 I have no idea. Proposing the MADAR event occurred pm, and was CDT, then both events occurred at the same time! That's too many "if's" for a definitive assessment, but very interesting nonetheless. In 1977 we didn't have the internet. The MADAR Project didn't even have a computer. We were not aware of, or had any data at the time in 1977, on what SETI was doing or had done. The WOW Signal story never appeared in the news until 1996! 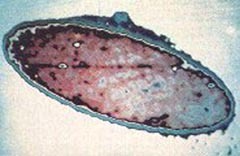 On August 15, 1977, Dr. Jerry Ehman, while working on a SETI project at the Big Ear Radio Telescope of Ohio State University, was startled to see something on the printout. The signal bore expected hallmarks of potential non-terrestrial and non-solar-system origin. It lasted for the full 72 second duration that Big Ear observed it, but has not been detected again. Amazed at how closely the signal matched the expected signature of an interstellar signal in the antenna used, Ehman circled the signal on the computer printout and wrote the comment "Wow!" on its side. This comment became the name of the signal. 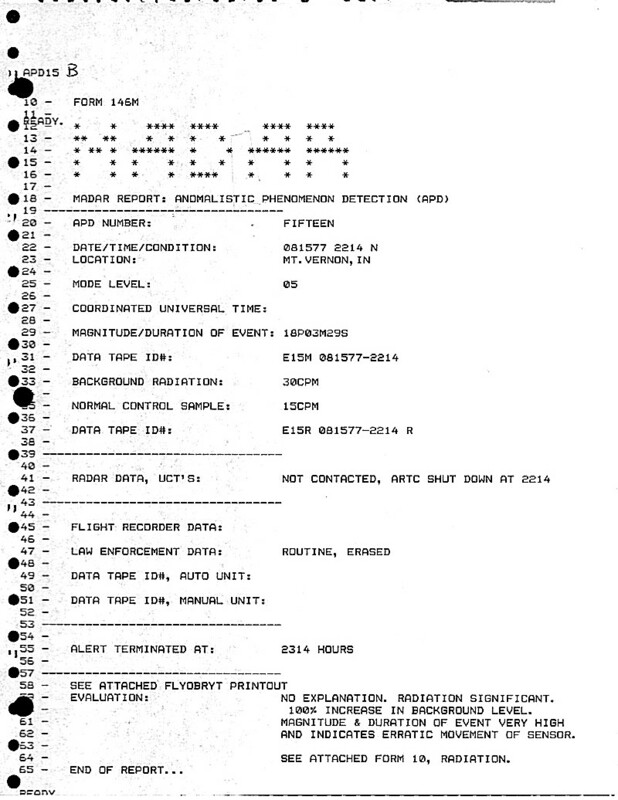 As always every other night, while the Big Ear was searching the skies for an alien signal, its observations were being recorded on a printout sheet. 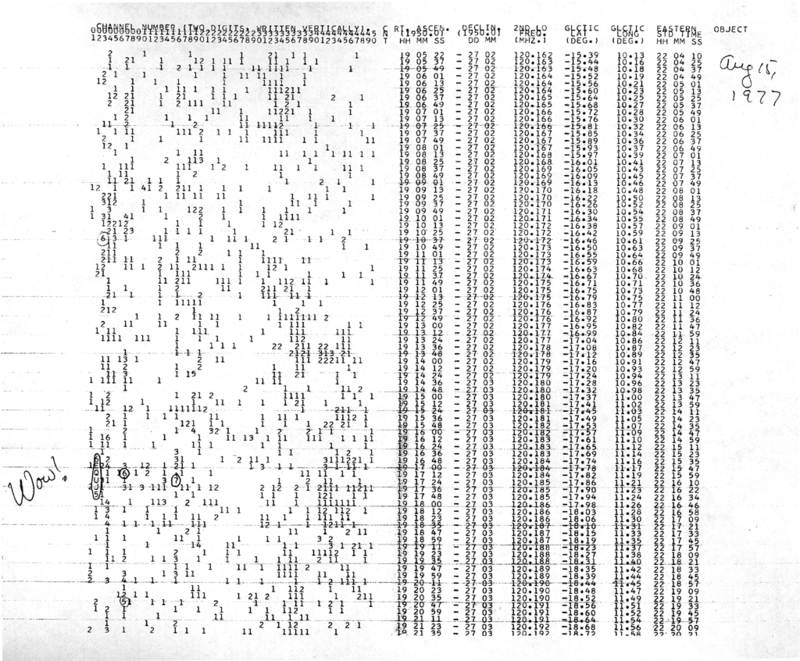 A long list of letters and numbers was continuously being churned out, one long string for every one of the 50 channels scanned by the telescope. A series of characters appeared recording an unusual transmission at the frequency of channel 2: "6EQUJ5" the list read. This startled Big Ear volunteer Jerry Ehman, a professor at Franklin University in Columbus, who was monitoring the readings that night. The series "6EQUJ5" described the strength of the received signal over a short time-span. In the system used at the time at Big Ear, each number from 1 to 9 represented the signal level above the background noise. In order to extend the scale, the staff added letters, with each one from A to Z representing increasingly stronger signal levels. 6EQUJ5 represented a signal that grew in strength to level "U," and then gradually subsides. In more familiar notation, the signal increased from zero to level 30 "sigmas" above the background noise, and then decreased again to zero, all in the span of 37 seconds. Two aspects of this signal immediately caught the attention of Ehman and project director John Kraus, who saw the results the following morning. First of all, 37 seconds was precisely the time it takes the Big Ear scanning beam to survey a given point in the heavens. Because of this, any signal coming from space would follow precisely the "Wow!" signal's pattern - increasing and then decreasing over 37 seconds. This practically ruled out the possibility that the signal was the result of Earthly radio interference. Secondly, the signal was not continuous, but intermittent. Kraus and Ehman knew that, because Big Ear has two separate beams that scan the same area of the sky in succession, several minutes apart. But the signal appeared on only one of the beams and not on the other, indicating that it had been 'turned off' between the two scans. A strong, focused, and intermittent signal coming from outer space: could it be that Big Ear had detected an alien signal? The MADAR 15 event of the August 15 lasted 3 minutes and 29 seconds, as the magnet variometer gyrated 18 times from North! 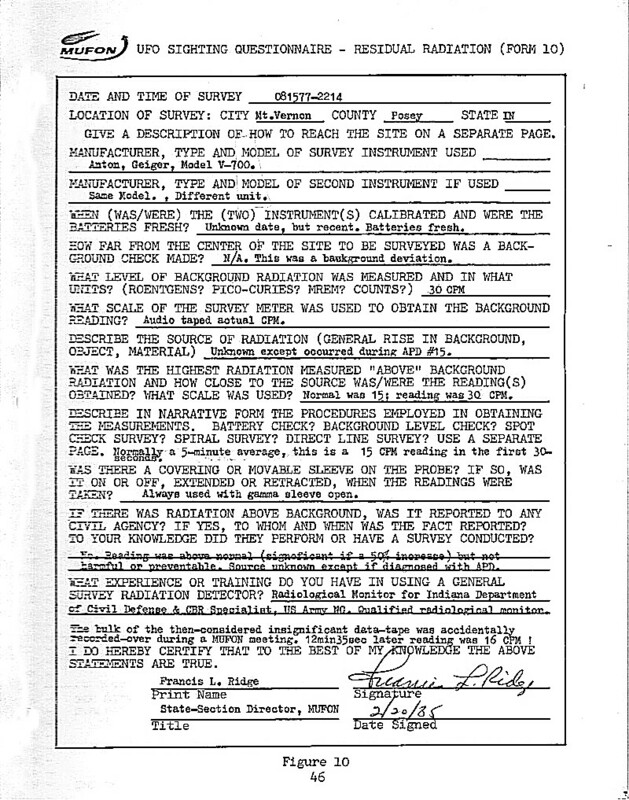 When the E15R data recorder was checked it was found that the background radiation had doubled! 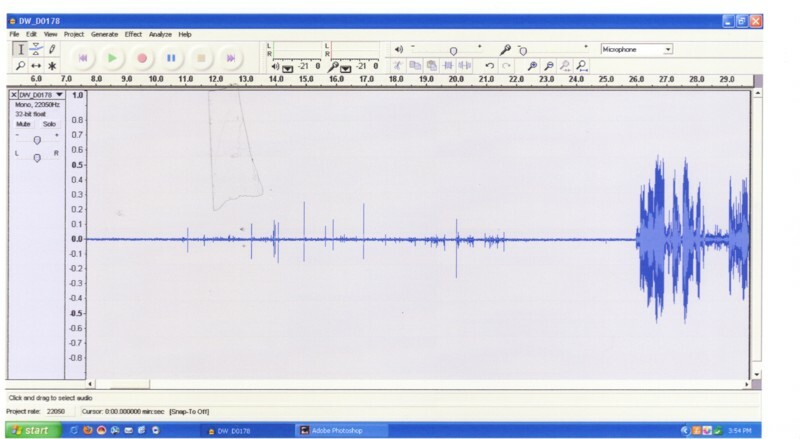 When I wrote this paper originally it was thought that it was not possible to post the MADAR 15 isolated sensor movement recording because the tape had been destroyed later in playback by the recording machine. To the rescue came another data tape recording. I had constructed a 50' antenna tower and antennas for receiving police, sheriff and state police, as well as aircraft transmissions in the whole region. 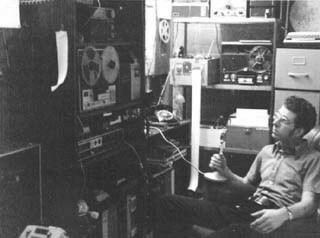 As a backup feature for the normal data recorders the TERS recorder system logged (in stereo) all those transmissions or anything going on in the facility. THAT recording contains most of the sensor movements induced by the EMF of the PPR or primary pulsing relay. In this graphic I used the right channel only, which eliminated all the noise from the left channel, and was able to pick up the clicks of the primary relay as the sensor moved in and out of the light beam. This is only the first few seconds and the radio transmissions begin to override the pulses. This is is the graphic displaying both channels, which has more noise from radio transmissions from the scanners than normarly desired, but the buzzing pulses of the relay from the sensor are much more pronounced, others imbedded in radio traffic. Later, when I did have a computer, I compiled a database of all that was going on in the region. The next graphic shows what I found. This illustrates events from June 9 to August 27. 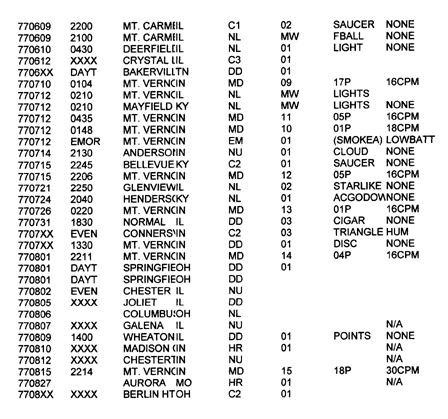 Column 4 shows UFO classification and "MD" for MADAR event. 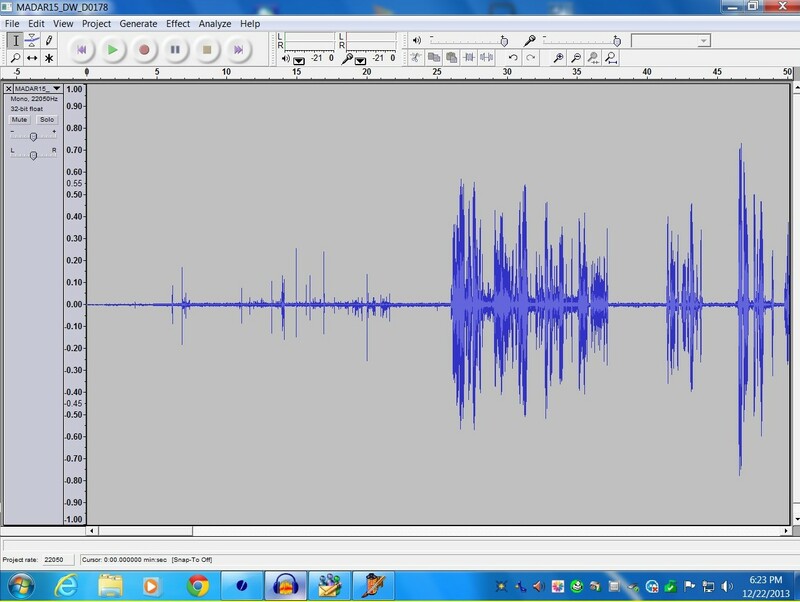 Be advised that some internet sites have posted what they claim IS the WOW Signal audio, but this is not real. 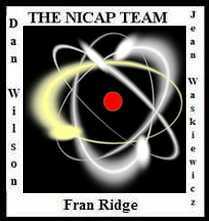 The SETI team had the capability to hit the record button if they had detected a signal while on duty, but Ehman wasn't on duty during the event. The interesting aspect of ALL our MADAR-detected disturbances, which include the August 15 event, is that the variations seem to be pulsed or the amplitude changes quickly as if caused by an alternating magnetic field. A natural deviation in the earth's magnetic field is more gradual and lasts for a longer period. Let me make it clear at this point that there were not ANY clear UFO correlations with the MADAR detections that summer. Another reason why Ehman, Gray, et al, should not be embarrassed. A magnetometer picked this up and was not hallucinating! Thus, since all of the possibilities of a terrestrial origin have been either ruled out or seem improbable, and since the possibility of an extraterrestrial origin has not been able to be ruled out, I must conclude that an ETI (ExtraTerrestrial Intelligence) might have sent the signal that we received as the Wow! source. The fact that we saw the signal in only one beam could be due to an ETI sending a beacon signal in our direction and then sending it in another direction that we couldn't detect. Of course, being a scientist, I await the reception of additional signals like the Wow! source that are able to be received and analyzed by many observatories. Thus, I must state that the origin of the Wow! signal is still an open question for me. There is simply too little data to draw many conclusions. In other words, as I stated above, I choose not to "draw vast conclusions from 'half-vast' data". Two different values for its frequency have been given: 1420.356 MHz (J. D. Kraus) and 1420.4556 MHz (J. R. Ehman). The frequency 1420 MHz is significant for SETI searchers because, it is reasoned, hydrogen is the most common element in the universe, and hydrogen resonates at about 1420 MHz, so extraterrestrials might use that frequency to transmit a strong signal. The frequency of the Wow! signal matches very closely with the hydrogen line, which is at 1420.40575177 MHz. The two different values given for the frequency of the Wow! signal (1420.356 MHz and 1420.4556 MHz) are the same distance apart from the hydrogen line­the first being about 0.0498 MHz less than the hydrogen line, and the second about 0.0498 MHz more. The bandwidth of the signal is less than 10 kHz (each column on the printout corresponds to a 10 kHz-wide channel; the signal is only present in one column). While checking with a colleague in Ohio, Dan Wilson, we were able to confirm the time zones. The times are virtually the same for the WOW and MADAR Events. In 1977 we didn't have a TG-105 Time Date Generator like we used with the Lunascan Project, nor a WWV atomic clock signal. We had to call the local bank and get the time, then set the flashcard digital clock by hand, easily a minute off at least. The MADAR System when triggered had a locking relay that turned on recorders and a geiger counter at the instant it shut down the clock timer. Both the MADAR 15 and WOW Signal were overlapping in time for many seconds. The date WAS indeed August 15, 1977, and the time WAS 10:14-15 PM. The MADAR Project had logged UFO reports and some earthquakes into the database, but not anything like SETI pulses. While MADAR tracked something 209 seconds, SETI was receiving their signal for 72 seconds, plenty of overlap. As I mentioned before, in 1977 we didn't even have a computer or conceive of putting SETI data in our database. We didn't know anything about the SETI discovery until 2010! And Dan Wilson, searching for any press releases, stated, "It must have been kept secret. I can't find anything on the event until 1996." Nineteen years later! So needless to say, when I wrote my 1994 copyrighted book, "Regional Encounters: The FC Files", I mentioned MADAR 15 but wasn't privy to what SETI had found so that sensational note was not added. Dan brought up a good point. Perhaps this "WOW" signal was meant for somebody here on Earth and not especially for the SETI Program. Three hundred and ten miles apart, three entirely different types of equipment picked up something anomalous. Not only was there a scientifically interesting radio signal (SETI, Ohio), but a strong variation with a magnetic / electromagnetic and nuclear component (Mt. Vernon, IN). The Ohio State University WOW Signal came in on channel 2, one frequency out of the 50 being monitored! In my opinion that means it couldn't have been a "disturbance"! As Ehman even stated, a disturbance would have shown up on all or most of the frequencies. Due to the methods all the data were obtained, that signal couldn't have come from a source 50 light years away. In my opinion it came from a source closer than that, a lot closer. And this event must have been detected in other ways all over the world. We just haven't looked! And if it wasn't, why and how was MADAR and myself singled out!